​Absinthe has been the beloved muse of the worlds most renowned artists. Not only an artistic inspiration, good absinthe itself is considered by many a work of art. Your Absinthe Spoon is the key element allowing you to see this art in its truest form. Dripping water over your spoon releases the beautiful aroma of your Absinthe. Presenting you that first sip to delight your palate, it fills your heart with mystique and for true Absintheurs of the world ~ touches your soul. ​Now it's time for you to buy your first absinthe Spoon and you're wondering what to consider before your purchase. There are many styles to choose from making it difficult, if not impossible, to make an educated decision on your first purchase. ​Most genuine absinthe brands have a slight bitter taste due to the presence of wormwood. To offset the bitter taste and enhance the presence of the delicate botanicals within the absinthe, sugar is used while performing the absinthe ritual. ​The Belle Époque absinthe preparation ritual involves placing a sugar cube on top an absinthe spoon that is resting on top your absinthe glass containing your dose of absinthe. Ice cold water is then slowly dripped over the sugar cube into the glass. As the water is added, you will notice the absinthe begin to swirl into opalescent, opaque trails forming what is known as the louche (pronounced loosh). 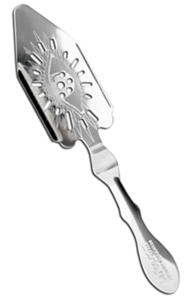 ​Spoons used in the Preparation of Absinthe are a unique and special design. They have a slotted or perforated head to allow water to flow through them. It will often have a raised rim on the top to better hold the sugar cube in place while water is added. To use the spoon properly, it is placed on top of your absinthe glass and a sugar cube is placed on top of the spoon. Ice cold water is then dripped over the sugar through the absinthe spoon melting the cube. ​As you slowly add water to your drink, you will notice the formation of the elusive louche. The louche is the milky, opaque color the absinthe takes on as the herbal oils and flavors begin to precipitate out as the alcohol content falls due to the addition of water. A proper louche is a sign of a quality absinthe and is considered a most important aspect of enjoying any absinthe. 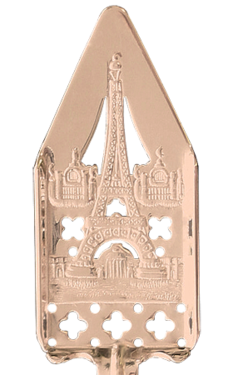 Take a look at the 1889 Eiffel Tower Absinthe Spoon below. ​There are three basic styles of spoons used to prepare absinthe. 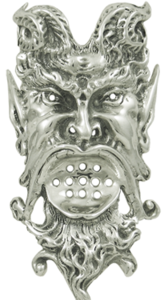 There is the standard style with the cutouts or slots on the end of the spoon (Eye Spoon Left), the center style with the cutouts in the center of the spoon (Skull Spoon Center) and there is the absinthe grille (Right). The grill is used exactly like the spoon by placing it on top of the absinthe glass and the sugar cube on top of the grille. ​If you look closely at the eye spoon above you'll see that it has ridges on the sides of the head that hold your sugar cube in place as water is added. It also has an indented area on the handle to more easily rest on the rim of your absinthe glass. 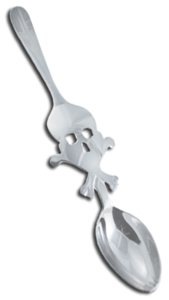 ​The Skull spoon shown above is designed to have its middle (skull portion) placed over your glass and your sugar cube on top of the skull. This portion of the spoon is concave shaped to better hold your sugar cube. As you become accustomed to drinking absinthe, you will find these features most helpful. Spoons are available in short, medium and long designs. The long style absinthe spoons are the most versatile as you can use a long one for a short glass but you cannot use short spoons on a tall glass. As your absinthe accessory collection grows, it is a good idea to have a few of each size. 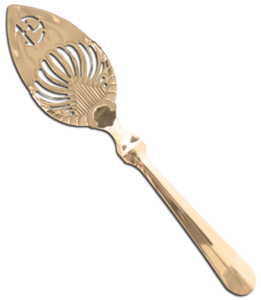 ​There are many finishes available for your absinthe spoon. We will discuss chrome, stainless steel, gold and silver. Chrome or Stainless are probably the best finishes for every day use. These finishes are very durable and are usually dishwasher safe. They will withstand a lifetime of cleanings and still have a like new appearance. I highly recommend them for a first spoon or if you are using spoons for a party due to their durability. If you want a spoon that will increase in value over time, a premium finish is the way to go. All absinthe spoons increase in value with age but the more expensive, thus rarer finishes, generally command higher prices. Gold and Silver plated absinthe spoons are very beautiful but definitely require additional care to maintain their premium finish. Premium finish absinthe spoons should never be put in the dishwasher. They should be cleaned with a soft cloth and warm soapy water. Abrasive polish must always be avoided as it may scratch the premium plating. You should clean your premium absinthe spoon with "Maas" brand cleaner whenever possible as it has no abrasive properties. If your premium plated spoon has become stained and you must use an abrasive cleaner, use the "Tarn-X" brand Silver Glaze. It has very mild abrasives and will also leave a protective coating on the spoon to slow tarnishing in the future. 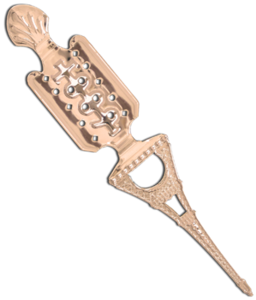 It is best to reserve your gold or silver plated absinthe pieces for special occasions. ​And of course, you must never use a gold or silver plated spoon for the "Flaming Method" of absinthe preparation. 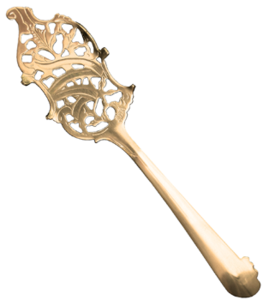 It should also be noted that as the spoon design becomes more intricate, the price will increase dramatically. Notice the spoons below. They are perfect examples of intricately cut designs with extreme attention to detail on the surface of the spoon. ​Since the re-emergence of absinthe, many retailers have started selling absinthe accessories. Most liquor stores and even department stores sell some type of absinthe accoutrement. This is helpful if you need an absinthe spoon or fountain immediately and price is of no concern. The problem is that retailers and online auction sites are notorious for selling low budget knock-offs. Like everything else, you get what you pay for with absinthe accessories. ​So if you see an absinthe spoon for $5.99, that's exactly what you will get. Thinner with less attention to detail it is a functional yet inexpensive absinthe spoon.